Tickets for Thursday's Game 7 go on sale at 2 p.m.
Dwyane Wade, LeBron James and Ray Allen of the Miami Heat celebrate after defeating the San Antonio Spurs during Game Six of the 2013 NBA Finals at AmericanAirlines Arena on June 18, 2013 in Miami, Florida. 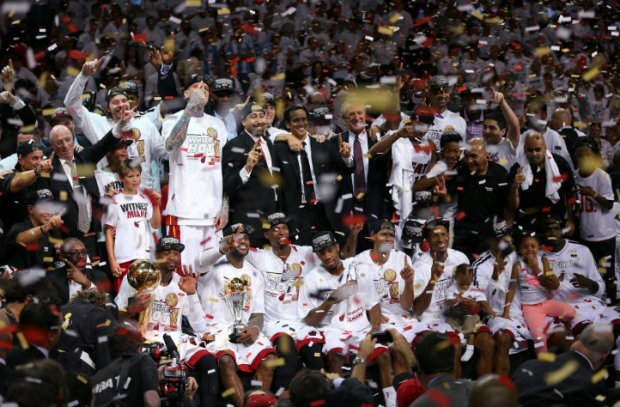 The Miami Heat will begin selling individual tickets to Game 7 of the NBA Finals at 2 p.m. Wednesday. The Heat forced a Game 7 with Tuesday night's amazing 103-100 win over the San Antonio Spurs in overtime. Individual game ticket inventory is limited and tickets are expected to sell quickly. Fans can purchase tickets online at HEAT.com, Ticketmaster.com or by calling 1-800-4NBA-TIX. There will be an eight ticket purchase limit per household. Tickets will not be available at the AmericanAirlines Arena Ticket Office for the initial on-sale date. Playoff tickets may be purchased at the AmericanAirlines Arena Ticket Office beginning on Thursday, June 20 at 10 a.m.
Game 7 will be played at AmericanAirlines Arena on Thursday, June 20 at 9 p.m.